SLEEPY HOLLOW, NY (Sept. 5, 2013) — Halloween season in Sleepy Hollow Country kicks off in force on Saturday, Oct. 5, opening night of the tri-state area’s largest fall events. Washington Irving’s macabre tale The Legend of Sleepy Hollow inspires Horseman’s Hollow, a 13-night interactive haunted attraction at Philipsburg Manor in Sleepy Hollow, N.Y., recommended for ages 10 and up. Stocked with professional actors and state-of-the-art special effects, Horseman’s Hollow has a high fear factor. Irving’s ‘Legend,’ recommended for ages 10 and up, brings the master storyteller Jonathan Kruk into the historic, candlelit interior of Sleepy Hollow’s circa-1685 Old Dutch Church, where for 13 evenings he offers a dramatic re-telling of The Legend of Sleepy Hollow accompanied by live organ music. The Legend Behind the ‘Legend’ is a new, daytime experience at Washington Irving’s Sunnyside in Tarrytown, N.Y. that highlights the author of the famous story. Tip: There is food onsite but we recommend that you pack a picnic lunch and some snacks. Make sure you have your camera lot's of photo opportunities. All events are held rain or shine. Proceeds support Historic Hudson Valley, the Tarrytown-based private, non-profit educational organization which owns and operates the historic sites that host these events. For Blaze, Horseman’s Hollow, and Irving’s ‘Legend,’ admissions are by advance purchase timed ticket. Blaze dates are Oct. 5-6, 11-14, 17-20, 24-31, Nov. 1-3, 8-11. The first reservation is 7 p.m. on Oct. 5-6 and 6:30 p.m. for the other dates. Tickets are $16 for adults ($20 on Saturdays), $12 for children 3-17 ($16 on Saturdays), and free for children under 3 and Historic Hudson Valley members. Horseman’s Hollow dates are Oct. 5-6, 11-13, 18-20, 25-27, Nov. 1-2, with the first reservation at 7 p.m. Tickets are $20 ($25 on Saturdays). Historic Hudson Valley members receive a $5 per ticket discount. Irving’s ‘Legend’ dates are Oct. 5-6, 11-13, 18-20, 25-27, Nov. 1-2. Seating is very limited, and there are three performances each evening on the hour, beginning at 5pm (6:15pm Fridays). Tickets are $16 for adults, $12 for children under 18. Historic Hudson Valley members receive a $5 per ticket discount. Legend Behind the ‘Legend’ takes place Wednesdays-Sundays in October, plus Columbus Day Monday, with the first tour at 10:30am. Tickets are $12 for adults, $10 for seniors, $6 for children 3-17, and free for those under 3 and Historic Hudson Valley members. Buy tickets online at www.hudsonvalley.org or by calling 914-366-6900 ($2 per ticket surcharge for phone orders). The Great Jack O’ Lantern Blaze, which drew more than 80,000 visitors last year, features more than 5,000 illuminated, individually hand-carved jack o’ lanterns. Elaborate single-pumpkin carvings and huge multi-jack o’lantern constructions are professionally lit throughout the landscape of Van Cortlandt Manor in various themed areas. Favorites such as the Undersea Aquarium and walk-through Tunnel O’ Pumpkin Love are joined this year by new installations including Venus Pumpkin Traps, an enormous sea serpent, a brontosaurus, and a pterodactyl. The brand new Museum of Pumpkin Art is the first ever exhibition space devoted to sculptural works inspired by (but not made from) pumpkins. The Museum of Pumpkin Art is made possible by the New York State Council on the Arts with the support of Governor Andrew Cuomo and the New York State Legislature. Also new this year is Blaze: The Soundtrack Volume II. Building on the success of last year’s soundtrack, Historic Hudson Valley teamed up with professional musician, radio personality, and Halloween fanatic Richard Christy to create a second volume of all-original music, selections of which will play throughout the event. The soundtrack is available as a CD at the event and also a digital download from iTunes and Google Play. Creative Director Michael Natiello leads a small team of Historic Hudson Valley staff and local artists who carve. In addition, more than 1,000 volunteers help scoop and light the pumpkins. Blaze artists will be carving on site during the event. The Great Jack O’ Lantern Blaze Shop offers a full bounty of Blaze-specific merchandise including hats, notepads, games, T-shirts, magnets, caps, mugs, and jewelry. Café Blazé, by Geordane’s of Irvington, will offer culinary treats including soup, veggie chili, muffins, pumpkin cookies, and cider. Horseman’s Hollow, a haunted experience in the heart of Sleepy Hollow, takes the tale of The Legend of Sleepy Hollow to its darkest extremes. 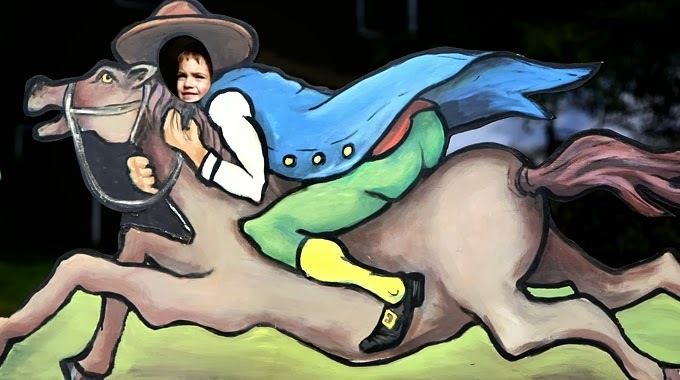 Historic Philipsburg Manor transforms into a terrifying landscape ruled by the undead, the evil, and the insane, all serving the Headless Horseman himself. Haunted house professional Lance Hallowell leads a crew of award-winning makeup and costume designers and a 40-member-strong cast of experienced actors to create an immersive, interactive, pleasantly terrifying experience, with state-of-the-spooky-art special effects. Custom built set pieces and period-correct costumes help orient the experience in Philipsburg Manor’s traditional time period of the mid-1700s. Lighting is by Emmy award-winning designer Deke Hazirjian of New York City Lites. Master storyteller Jonathan Kruk offers a dramatic re-telling of Washington Irving’s classic tale, The Legend of Sleepy Hollow, featuring the Headless Horseman, Ichabod Crane, Brom Bones, and Katrina Van Tassel. Flavored with live spooky organ music by Jim Keyes, Kruk’s storytelling takes place in the historic, candlelit setting of the Old Dutch Church in Sleepy Hollow. The circa-1685 stone church is across the street from Philipsburg Manor, where visitors will park. Performances last about 45 minutes. 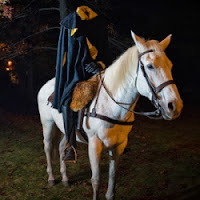 During October, Sunnyside celebrates its connection to Washington Irving’s classic tale, The Legend of Sleepy Hollow. Tours of Irving’s home – a colorful blend of architectural styles – will showcase numerous objects related to Irving’s famous story. Visitors on Saturdays and Sundays can enjoy a shadow puppet performance of The Legend of Sleepy Hollow and experience one of Irving's spooky tales on a walk through the woods. Sunnyside is on West Sunnyside Lane, off Route 9 in Tarrytown.